SAN FRANCISCO — Apple's new iPhone 7 and iPhone 7 Plus have a number of new features, including a force-sensitive home button (no more clicking), water- and dust-resistant enclosure, better camera, brighter display, stereo speakers, faster processor and improved graphics performance. However, one key feature is missing: the 3.5mm audio port. The move wasn't a surprise. 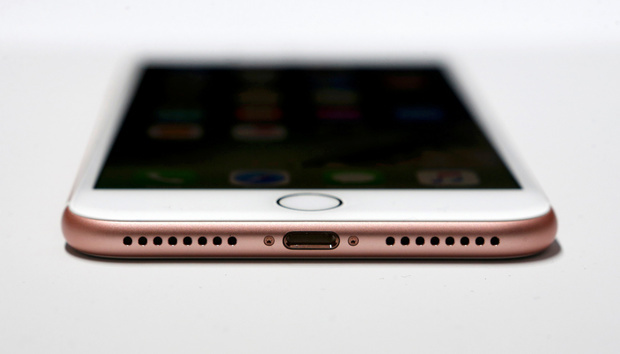 Reports surfaced months ago about an iPhone without an audio jack. However, during its annual product showcase, Apple explained why it decided to remove the standard port. Phil Schiller, senior vice president of worldwide marketing at Apple, said it was a necessary change to improve audio clarity and controls, free up space for better internal components and to make the device water and dust resistant. Apple is forcing you to make a compromise in name of audio innovation, according to Ian Fogg, senior director at IHS, a market research firm. However, Apple should be able to deliver audio innovation, water resistance and other improvements without doing away with a standard port, Fogg says. Unlike Apple's long history of dropping support for legacy technologies such as floppy disk and CD drives, USB ports and the company's 30-pin connector, the headphone is a "riskier move for Apple" because of the many noncomputing devices that rely on the 3.5mm input, according to Fogg. "[Users] will have to compromise with adapters for many, many years to come." Fogg does not, however, believe the change will affect businesses. "[Business] users routinely use a headset to make phone calls, but many of those users will already have adopted Bluetooth earpieces for hands-free use," he says. Accessories that connect via the standard audio port, such as Square's magnetic credit card reader, will work with Apple's Lightning-to-3.5mm audio adapter, but they'll have to dangle from a short cord. That's not an ideal user experience. And professionals who like to charge their iPhones while making calls via headphones will now have to decide between the two. Schiller tried to explain the reasons why Apple removed the headphone jack, but his message generated instant scorn and ridicule on social media. "The reason to move on … really comes down to one word: courage," Schiller said. "The courage to move on to something new that betters all of us, and our team has tremendous courage." It's too soon to tell whether or not the headphone jack removal will become more burdensome than liberating in the enterprise, according to Shawn Wiora, CIO of Creative Solutions in Healthcare, a company that owns and operates nursing facilities. "We have a lot of people on the headset during the day, and if your cord gets a little old, you end up with the static," Wiora says. "We've had a lot of user issues because of the cord," he says. Wiora also thinks Apple's decision might ultimately reduce broken or damaged cords, and fewer cords is a good thing in certain industries, he says. "Healthcare looks at things differently," Wiora says. "A cord represents potential problems. A cord can get caught when you're walking down the hall or working with a patient." Other improvements to the iPhone will likely be more significant to the enterprise than the missing audio port, according to Wiora. For example, Apple increased the on-device storage capacity of the iPhone and ramped up the processing power, he says. "If you're not really relying on thousands of users to do their job 20 seconds more efficiently per transaction, which we are, then [faster processing and higher storage] may not be of interest," Wiora says. "For us, this is a wow factor." Patrick Moorhead, president and principal analyst at Moor Insights & Strategy, also believes iPhone 7 will bring a number of new benefits to business users. "By making the iPhone 7 water and dust resistant, this reduces an objection that IT has had in the notion that iPhones are easy to break," he says. "The new iPhone 7 should be more reliable in the long haul." Improvements to the iPhone 7 processing and graphics performance are also "enormous" and the hardware could power large displays and keyboards, if Apple ever embraces modularity, according to Moorhead. "I could see CIOs interested in the notion of workers having one device and docking to large displays and keyboards." Fogg of HIS agrees the processing power delivered by Apple's new quad-core A10 Fusion chip should be a major improvement for business users. "This helps all employees become more productive on their smartphones, most especially those using rich media applications or desktop-level productivity applications," he says. "Apple adds major new features every year on the iPhone range. It's easy to forget in other computing markets innovation happens at a much slower pace."